Although Gimli is named after the dwarf in the Lord of the Rings she is anything but small. She is even a very large cat > 6kg. She has very good boning and an excellent fur with very warm colors. 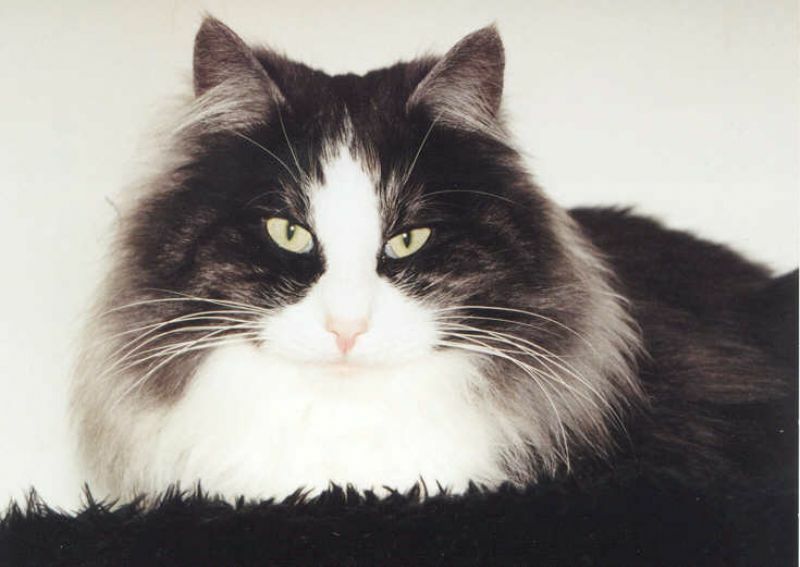 She is a daughter of Aisha av Froskeland and Harald av litte kattestupet. Kayleigh was our never expected surprise of Pernille and Harald, this was meant te be some years earlier. Donar no more than a kitten had sired this boy. 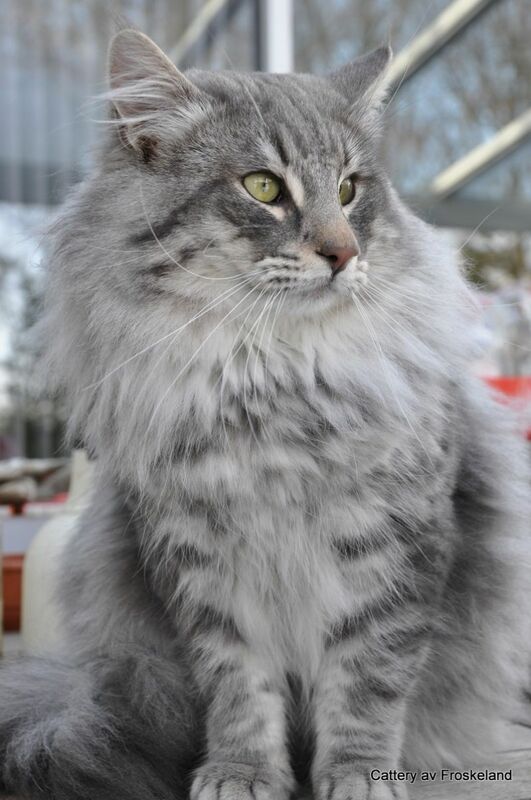 Wendy is his mother which beautiful coat he inheritted. Fredi is fond on walking and is able to find the smallest spot to break free. He has a good "boning" and excellent shaped head with most expressive eyes. 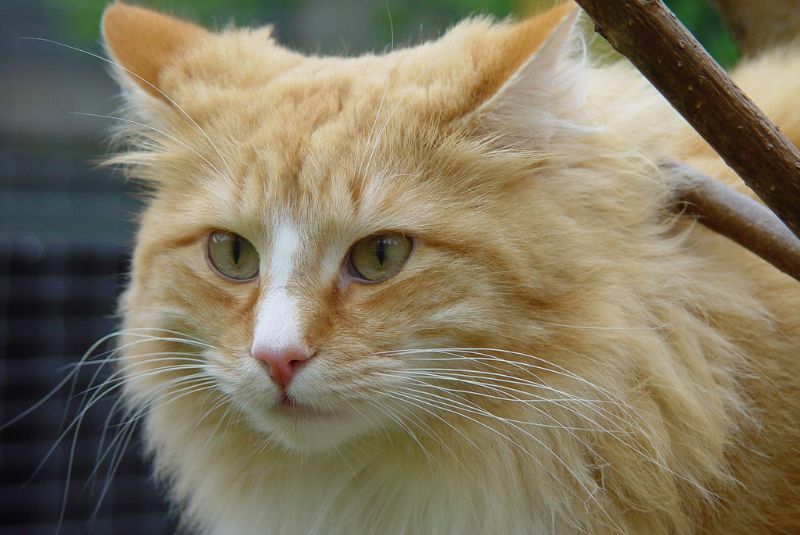 Einar is a beautiful Red Silver Tabby Boy with an amazing character. He is a son to Wendy av Froskeland and sired by Varg av Froskeland. He is having an excellent boning and a beautiful well balanced head. Unfortunately Einar has passed away in Februaryi 2018 way too young, as a consequence of Lymfonia cancer. Until now he leaves an empty spot behind. 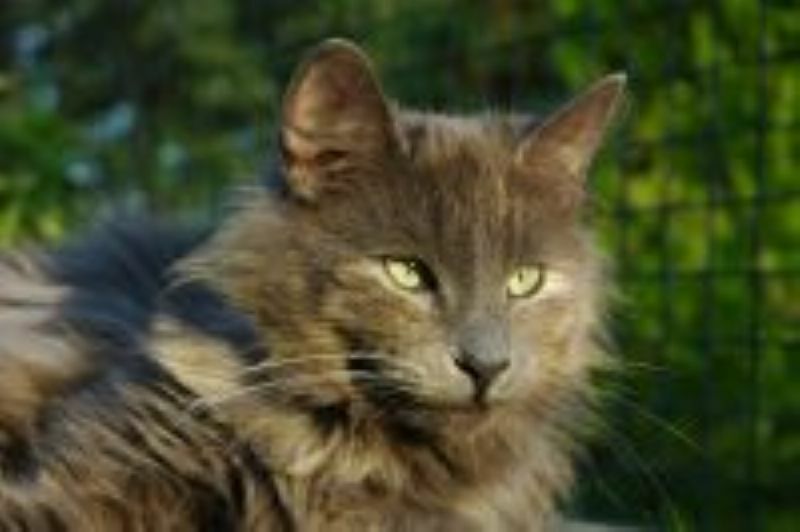 Indy is a very beautiful Silver Tortie with white she has amazing beautiful shaped " Kajal" eyes. My love did not survive a peritonitis caused by a perforation of the intestinal. Hannah is a very large cat she is a daughter of Varg and Deppj. Cassey is a child of Ute and Odyn of which she inherents the boning. She is Blue Smoke and has beautiful eyes like her mother. Odyn came to us as a small boy who was directly adopted by Fallon, at that time he grew up like a brother to Odine and Olille. He is very sweet but "bossy" ,now he growed older he is much more relaxed. Odyn is having very heavy bones and a beautiful Blue Silver Tabby blotched fur. He inherits his heavy boning. Hedi is a beautiful Black Smoke a daughter to Deppj av Froskeland and sired by Varg. She is having a really easy going character. Despite het false start she became a reasonable large cat. 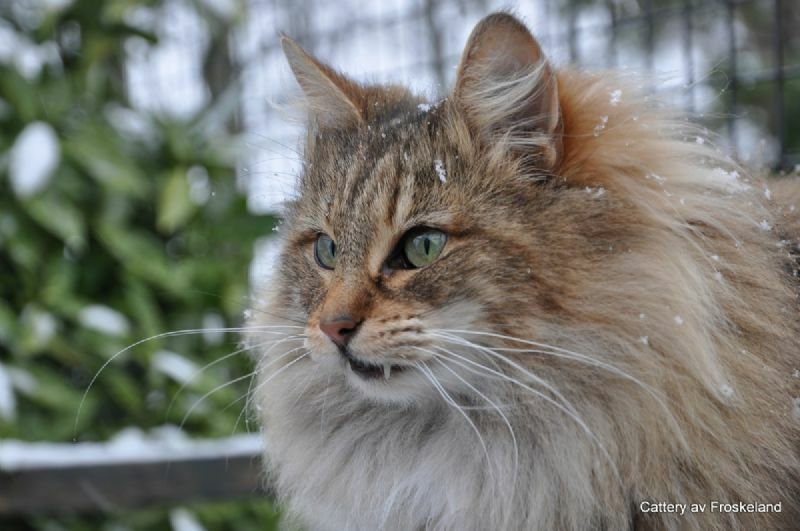 Hedi is the mother to Mette and Marit who both stayed in the cattery. Aisha is a black torty tabby blotched cat with an excellent boning which she inherits. 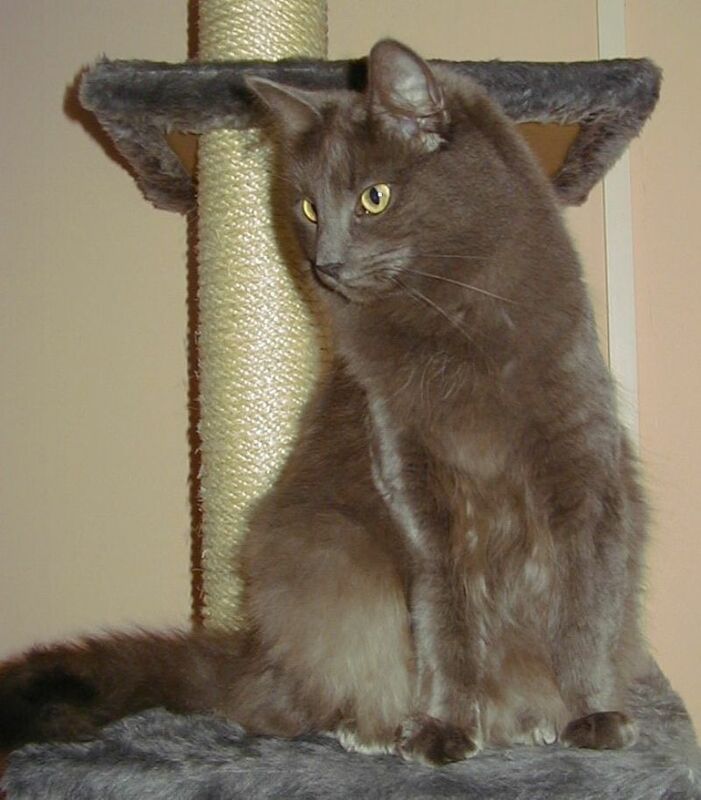 Daisy is a beautiful tortie smoke girl, with nice silver undercoat and warm colored topfur. Due to her white marking whe call her Berner Senner. Daisy has excellent boning and is a child of Ute and Harald, she has a strong character. Deppj is a sister to Daisy with slighty heavier bones. She is a very lovely cat and cuddley. Pernille is a very lovely girl and became unexpectedly at the age of 10 mother to a very beautiful daughter. Even more unexpectedly, as she was hardly in heat, at the age of 13 she became mother to Odin jr, during the c section she has been neutered as well. Queeny is a big girl, with a strong bone structure and an excellent expression. 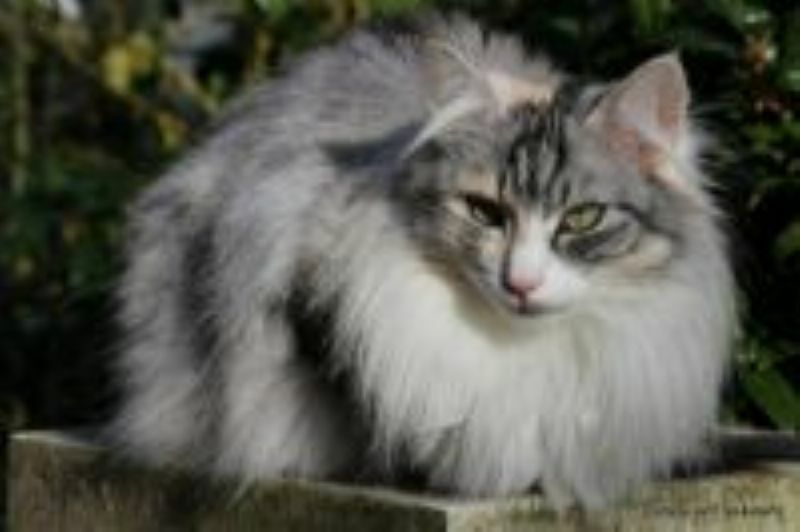 Wendy is a very beautiful girl with a silver tortie fur and beautiful " kajal" eyes. 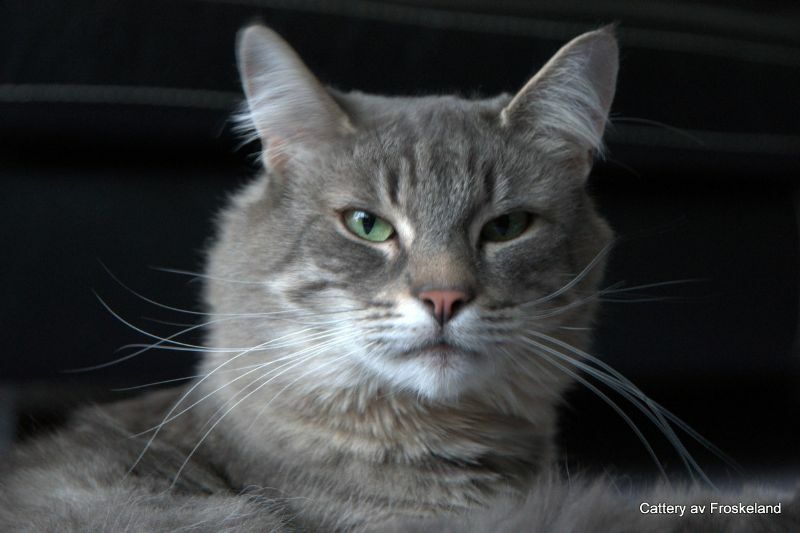 Ute is a sweet Blue Silver Tabby and is a very big girl. 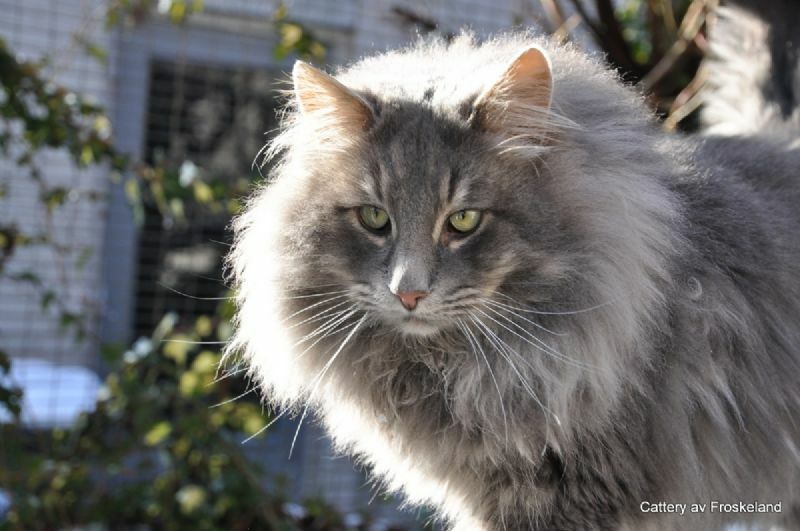 Fenris is a beautiful tom cat who did win a lot of prices and nominations. He has an excellent Silver spotted fur and a beautiful well balanced head. Fenris is a son to Kisser and Bjork. 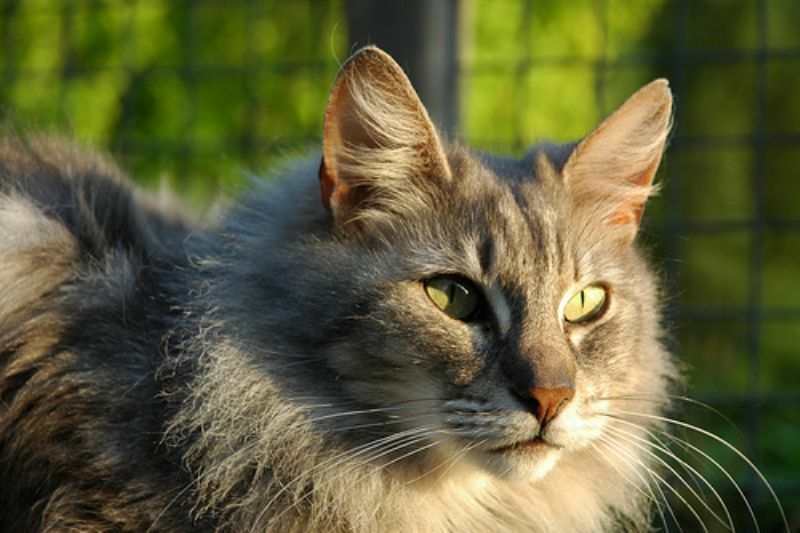 He is the ancestor to all our Silver torties. 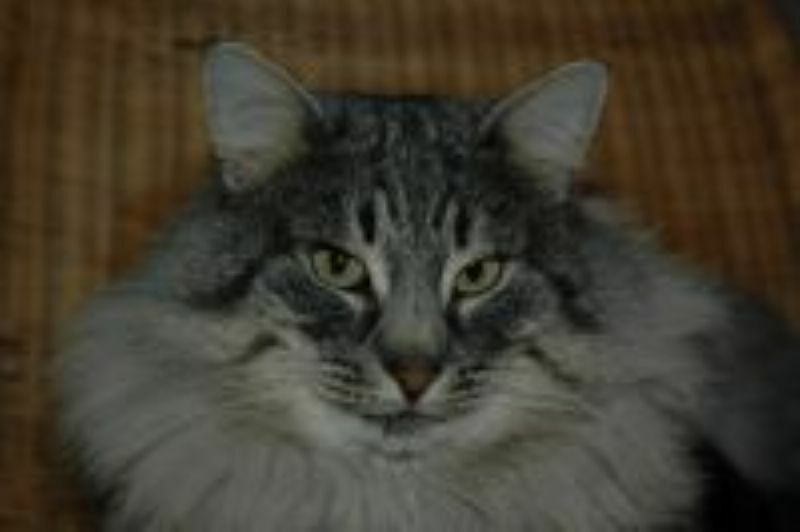 Varg is a blue Silver tabby blotched tom cat and almost a copy to his father Odyn. He is a son of Raisha and he inherited her amazing character. Bjork is a very cuddly big boy, he likes to sit on your shoulder preferable on the left side. Kira is a daughter to Edrikke and Atilla. She did inherit his length and her mother beautiful expressive eyes. 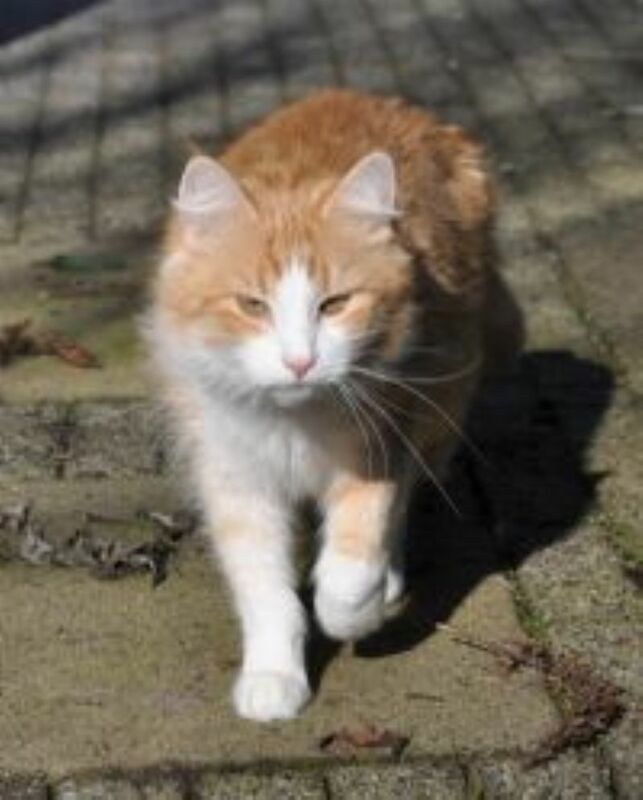 Stor is a red tabby tom cat, very beautiful in type. He has to `nibble` on everything. He has an excellent shaped head with straight noseline and very good pronounced chin. Raisha is a rather large cat, although slim she is more tha 5 kg.She is a daughter to Olille and Pelle and did inherit his boning. Raisha has a thick beautiful Blue Tortie fur, a most amazing head with straight nose line and a very good pronounced chin. Odine is a tortie( tortoisshell) without white she is a daughter to Fallon and Gandalf. 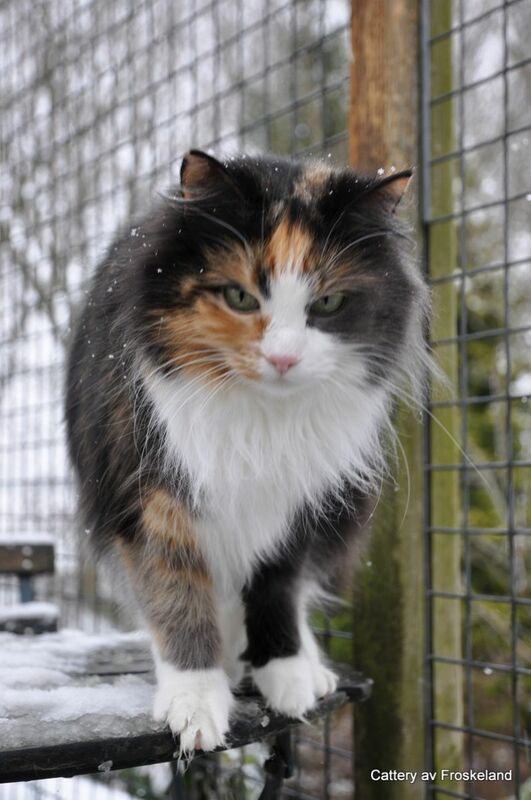 She is very affectionate and addicted to hugs and cuddles, our visitors are always occupied with her. 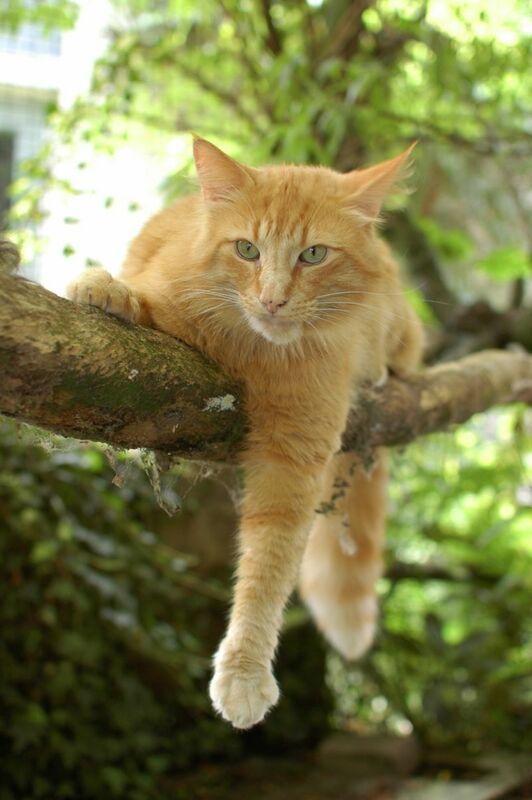 Gandalf is a beautiful Red Tabby with white, he is very loving and on shows he conquers the hearts of the judges by Climbing on their laps. He is a son to Edrikke and Leon. 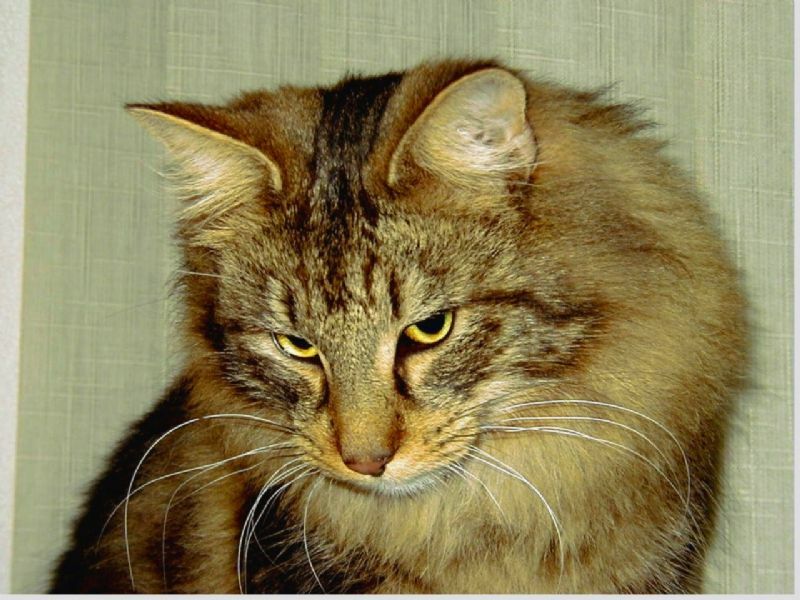 Leon is a really handsome tomcat, who did win various prices, he is one of our ancestors and one of the first imported cat from Scandinavie. He has a very good quality Black Tabby Blotched fur with an very nice warm color. He has an excellent head good nose line and chin but most of all are his most expressive eyes( wildlook) he is a son to Rasmus and Edvina. 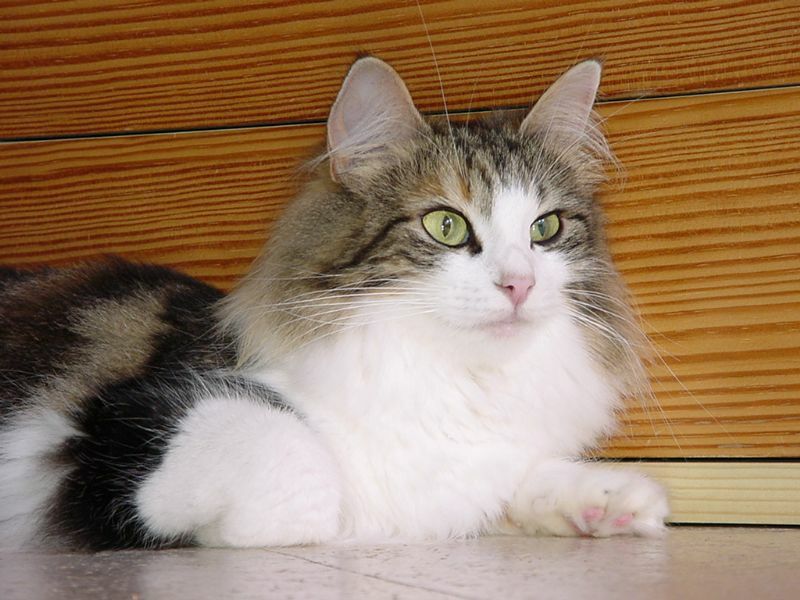 Kisser is a sweet cat, with a temperament to some other cats. 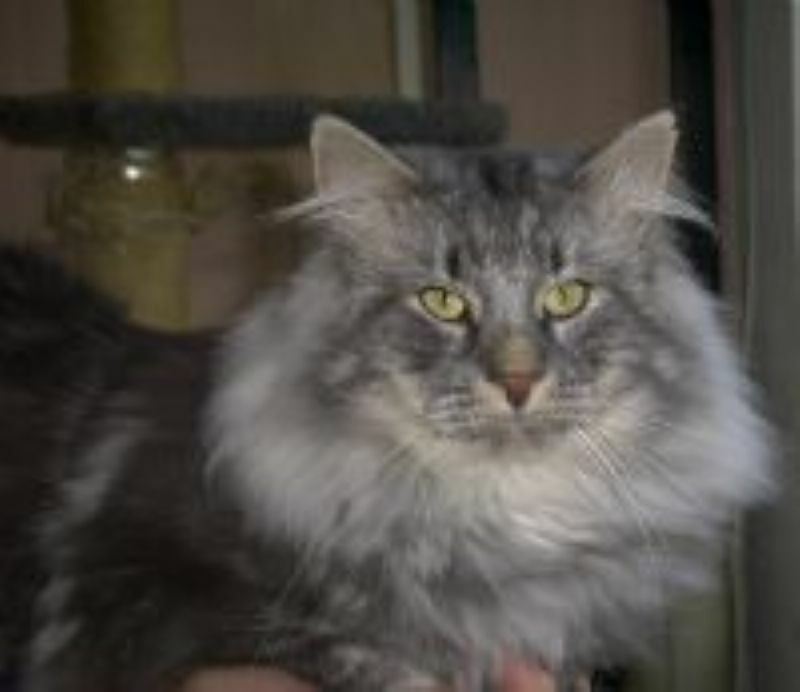 She is big and has an excellent hick blue/silver tabby fur her kittens are always beauties. She passes her long nose line and good chin on to her kittens. 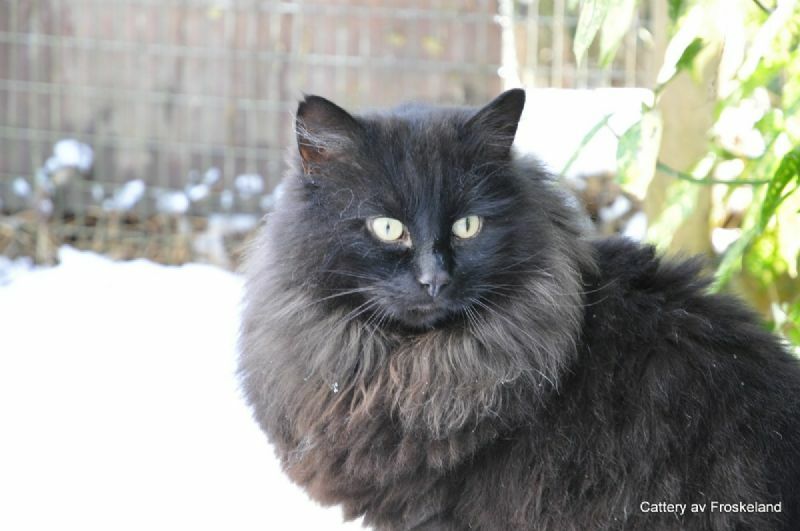 Almer is a handsome Black Smoke Tomcat with a nice thick long fur. 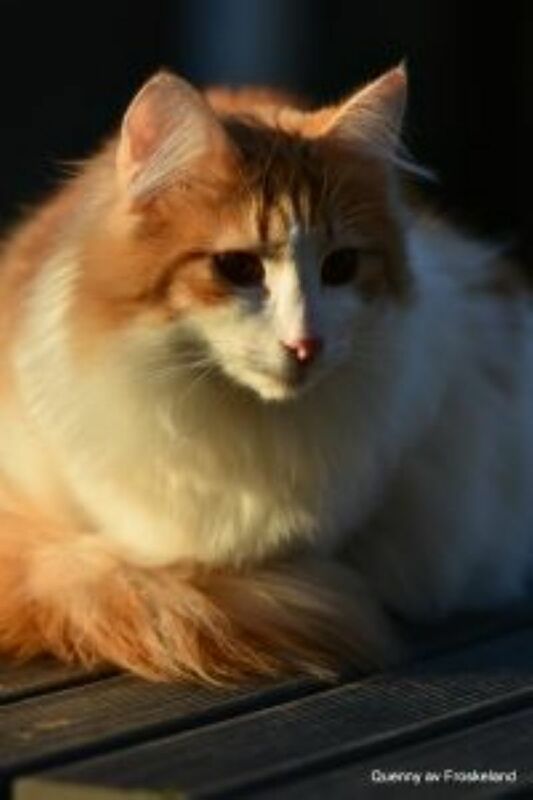 Almer is Our first Tomcat with a very sweet, open and relaxed character. He is the Father of Bjork. We took Fallon with us when she already was somewhat older. 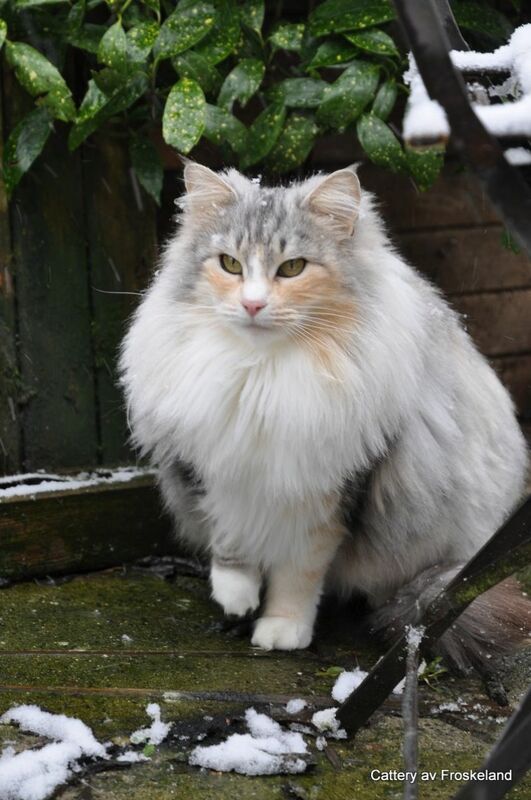 She is a very large cat, with a beautiful dense fur. Edrikke is a beautiful Black torbie blotched she has a lively character, she is one of our ancestors, her pretty Kajal eyes, can be seen by many descendents.